Gifs have rapidly become a highly popular media file, shared on various social networking platforms. But the fun quotient increases when you make a GIF on your own. Have you ever made your own animated GIF images? GIFs have become very popular these days because it takes less time to view than a video and it is more expressive than a photo. If you’ve ever thought of creating a GIF yourself, then you can read our article for 7 best GIF creator apps on Android. GIF Maker-GIF Editor is one of the most popular GIF creator app. You can cut and crop before creating the GIFs. You can add over 200 photos to create GIFs. You can also add text, stickers to the existing GIFs. It has a rating of 4.5 on Google Play Store. The app requires Android 4.1 or above. Must Read: Funniest Android Apps To Make You LOL! Gif Me! Camera is the best app for GIF and short video making. It can capture up to 14 seconds of short video. It has real time stickers, text, color filters, and other features. It also supports stop motion and video mode. You can also add watermark to your GIF. It has a rating of 4.3 on Google Play Store. The app requires Android 2.3 or above. GIF Studio is a nice app for GIF creation. It contains various features like effects, stickers,text, and much more. You can also crop GIFs to minimize the size of the file. It has a rating of 4.0 on Google Play Store. The app requires Android 4.0 or above. Giphy Cam is one of the fresher GIFs creator app. The camera captures a short video and you can alter that video with huge filters,stickers, special effects, text, and much more. It’s free app and has a rating of 4.2 on Google Play Store. The app requires Android 5.0 or above. Motion Stills is a GIF creator app developed by Google. It has two modes. You can capture a video and then turn it into a GIF. The second mode lets you shoot slow motion video. You can share your motion Stills as looping GIFs or as videos to your friends. It is a free app. The app requires Android 5.1 or above. Pixel Animator is exactly a pixel art application. Using this app, you can create GIFs with your artwork. The free version of the app allows you to make GIFs with up to 15 total frames. The most useful feature of the app is to port the prior image in a GIF to the next image. It has a rating of 4.1 on Google Play Store. The app requires Android 2.3 or above. PowerDirector is one of the best video editing apps with GIF support. The feature includes free video effects, slow motion, reverse video, edit background & more. The app is free to download. It has a rating of 4.5 on Google Play Store. The app requires Android 4.3 or above. 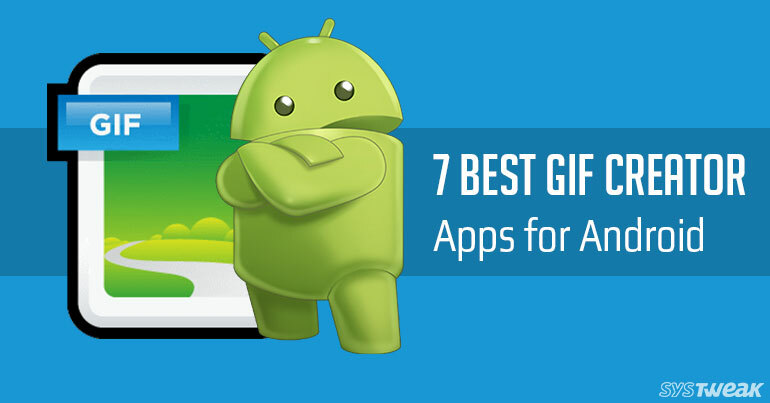 So, these were our picks for top 7 best GIF creator apps on Android. We hope you enjoy making own GIFs. If we forgot to add any of the best GIF creator apps for Android, tell us in the comments section below!